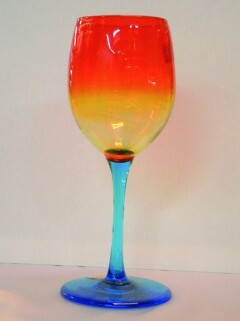 Ryukyu glassware is very colorful and decorative as well as simple and warm. Craftsmen from Nagasaki and Osaka during the late Meiji era were the first to employ the style. In Okinawa after the war the colorful glassware was made from recycling waste glass bottles, and it is to this day.. Neither natrium nor kalium are used for coloring, but occasionally pigments are added to transparent glass. Seven colors are used; for example transparent glass is made from juice bottles, blue from liquor bottles, and green from bottles of carbonated drinks.